It has become a norm in Nigeria to intimidate, harass and blackmail judges into perverting justice in the favor of the dictator-in-chief, Muhammadu Buhari, against the rule of law. Justice John Tsoho is an example; he was used by Muhammadu Buhari to remand Nnamdi Kanu, the leader of the Indigenous People Of Biafra (IPOB) in Kuje prison against a court order to release Nnamdi Kanu unconditionally. A careful observation of the last court proceedings of Nnamdi Kanu's case; on 17th November 2016, at the Federal High Court Abuja, revealed that “the hand of the monkey has entered the soup." Dictator Muhammadu Buhari have started manifesting his dictatorship on Justice Binta Nyako, to satisfy his unquenchable thirst to deny Kanu bail and jail him. Read also:BIAFRA: NNAMDI KANU VS NIGERIAN GOVERNMENT: WILL JUSTICE BINTA STAND BY THE LAW OR BY HER BROTHER BUHARI? Justice Binta consistently harassed the counsels to Nnamdi Kanu (in John Tsoho's manner) during the court session. She accused the supporters of Kanu especially IPOB principal officers, who were in the court; she also encouraged the harassment of Kanu’s supporters outside the courtroom by keeping mute while the DSS molested the supporters outside the court premises without any reason. It was observed also that Justice Binta ordered that nobody should capture video or image of Nnamdi Kanu, the seizure of electronic devices such as phones, camera and electronic devices. She made orders targeted at intimidating the supporters of Kanu and IPOB officers who were present in their large numbers to stand by their leader, Nnamdi Kanu. It is evident also that Muhammadu Buhari has ordered Nigerian journalists to maintain a total media blackout on Kanu’s court proceedings. Buhari wants media blackout, to create a comfortable environment for Justice Binta to pass influenced judgment in his favor; that was the reason for the heavy attack on Biafra Writers/Reporters and supporters with electronic devices meant to record or capture images. These are clear signs that Muhammadu Buhari has started dictating for Justice Binta. Justice Binta should know that for ones name to be ‘a cast-in-gold', there must be a sacrifice made. Justice Binta must resist Buhari’s harassment, blackmail and intimidation now, before it becomes too late for her. Justice demands that Nnamdi Kanu be released unconditionally as the court has ordered. 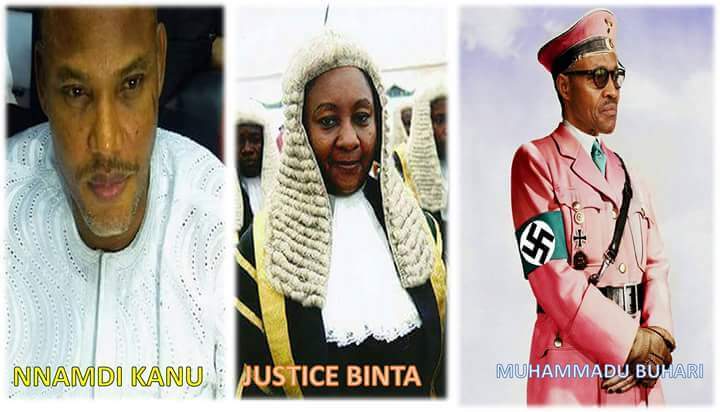 The world is expecting Justice Binta to uphold the rule of law and not the will of Dictator Muhammadu Buhari. Justice Binta Nyako must know that the eyes of the great Indigenous People of Biafra IPOB are watching her closely from the four corners of the earth. The international community is not blinking on Kanu’s case because he is a prisoner of conscience and an icon of international importance. It is time to let Kanu go, anything less than the unconditional release of Nnamdi Kanu amounts to international disgrace for Justice Binta; more intimidation for the judiciary and more calamity for Nigeria.